24 ways is the advent calendar for web geeks. Each day throughout December they publish a daily dose of web design and development goodness to bring you all a little Christmas cheer. 12/2/2011 : Conditional Loading for Responsive Designs is an article by Jeremy Keith about responsive design strategies that focuses on mobile first. I just discovered a great meetup group “Boston Front End Designers”. I missed the talk on the design aspect, but came to part 2 “ at the Cambridge Innovation Center. Great talk and the best pizza! Adam Salsman, who lead the technical team from the Boston Globe along with engineers Jesse Weisbeck, Dan Middleton, Ian Cohen and Caz Vonkow talked about the challenges of implementing a responsive design, using local storage, handling advertising in a responsive site, and answering lots of questions. 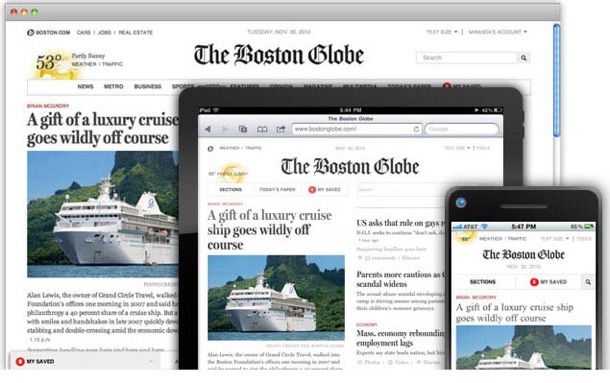 The Boston Globe has proven you can teach an old dog new tricks. Investing in a total redesign of their site that makes use of the functionality needed to keep subscribers and play nice with all devices. The site went live in September of this year. The website has a responsive design that adapts to different window sizes, browsers and devices, and it has a built-in Instapaper-type SaveMe feature that saves articles for reading off various devices even on the subway or where you have no connections. The overhaul has incorporated the talents of Boston design firms Filament Group, and Upstatement, as well as a large internal team, and pre-empts the need to build separate apps for each device. See the video about the building the Bostonglobe.com.